When you think of vision, you may not think about what it really means until you've started to lose some of it to AMD. But the reality is AMD is a chronic condition of the eye that causes central vision loss. It affects your central vision, which is the center area of what you see. In fact, most of the things we do everyday require central vision. 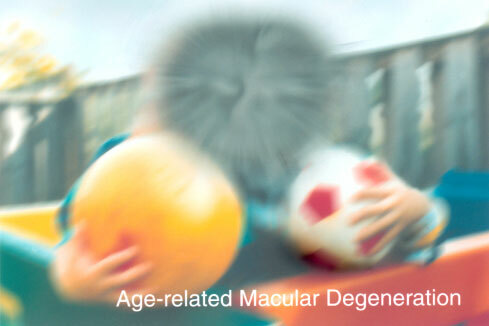 This central vision loss from AMD is caused by damage to the center of the retina, otherwise known as the macula. For some people, AMD progresses slowly. For others, it may progress faster. 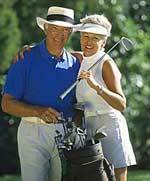 But AMD is a major cause of central vision loss in Americans aged 55 and older. So when you've lived your life being able to do the things you wanted to, when you wanted to, central vision loss can leave you missing more than just your sight. 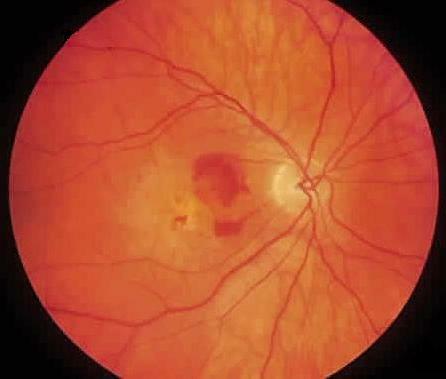 The role of the retina The retina is the light-sensitive area found at the back of the eye that is critical to seeing. It can turn light, or an image, into electrical impulses, or nerve signals to your brain. It's your brain that works with your retina to decide what you are looking at. So if you're holding a book, it's your retina that "tells you" it's a book. The role of the macula The macula is located in the center of the retina. It is the area that lets you see color and fine detail, which is critical to performing everyday activities. It's the macula that helps you in tasks like reading or even cooking. So if you're reading a book, the macula allows you to see the words on each page. If you are cooking, it will help you see that the cookies are just right or are burning. If the macula is damaged because of AMD, you'll have blurred central vision. You may also notice that straight lines seem wavy. AMD is a major cause of severe central vision loss in Americans aged 55 and older. And, it is more common in women than men. It is estimated that 1.2 million people in the US have wet AMD. Over the next few years, the number of people to get macular degeneration is expected to grow. In fact, by 2020, approximately 3 million people may be diagnosed with advanced AMD. There are two forms of AMD—wet and dry. Dry AMD is more common than wet. In fact, more than 85% of AMD patients are diagnosed with dry AMD. Wet AMD is the more severe form of the disease and it can progress very quickly. Although only 10% of people with dry AMD will get wet AMD, it is a major cause of central vision loss in adults. About 200,000 people are diagnosed each year. Wet AMD is the most serious form of AMD. And, it can progress very quickly. Although only 10% of people (1 out of 10) with dry AMD will get wet AMD, it is a major cause of central vision loss in adults. About 200,000 people are diagnosed each year. Wet AMD occurs with the abnormal growth of blood vessels in the back of the eye. These blood vessels grow specifically under your retina. As the blood vessels grow, they can leak blood and fluid, which can cause scarring on your retina and substantial damage to the macula. This leakage may result in the loss of your central vision. The earliest symptom of wet macular degeneration is vision change. If you notice that straight lines appear wavy, or that doorframes don't seem straight, you should get an eye exam as soon as this occurs. It may be an early sign of wet AMD. Today, retina specialists can prevent vision loss from getting worse or even help you get some of your vision back. But early diagnosis is critical. If you think you have symptoms of wet AMD, see your eye doctor immediately. Dry AMD, the most common form, develops slowly over time. You may or may not notice vision loss in the earlier stages. In fact, many people who have dry AMD don't even notice any signs or symptoms. Dry AMD occurs when cells and blood vessels underneath the macula break down and cause deposits called drusen. It is this drusen that can make you lose some vision. 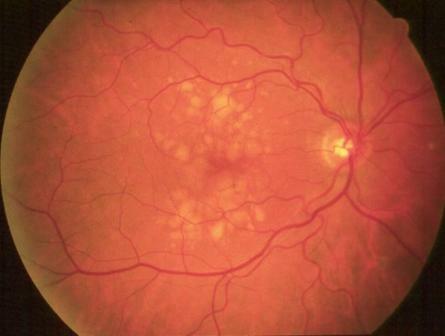 Early diagnosis is very important when it comes to AMD. Dr. Serdahl and Dr. Jones will conduct tests to determine if you have AMD and whether it is dry or wet. With early diagnosis and proper treatment, the progression of AMD may be delayed. And, the earlier it is detected, the better your chances are of keeping your vision. However, for some people, damage caused by macular degeneration can't be fully reversed. Hot Laser Treatment. A hot laser is beamed into the eye to burn away the abnormal blood vessels. Photodynamic therapy (PDT). This therapy is for treating abnormal blood vessels that are located under the fovea. The fovea is at the center of your macula and provides your sharpest vision. PDT combines a cold laser with a light sensitive drug that is injected into your bloodstream. When the cold laser is focused on the macula, the drug releases substances that act to close off the blood vessels without damaging the macula. Preventative measures. The Age-Related Eye Disease Study (AREDS) showed that taking certain supplements may reduce some risks of getting advanced AMD. Taking a daily supplement of vitamins A, C, and E—along with beta-carotene, zinc, and copper—may help. Smokers should not take beta-carotene supplements. During your routine eye exam with Dr. Serdahl and Dr. Jones your eyes will be dilated to examine the retina in detail. We will be able to tell at the conclusion of the exam if you have AMD. If you have questions or concerns about AMD, be sure to ask Dr. Serdahl or Dr. Jones during your exam!